Wellington, August 9 JY&A Fonts (http://jya.net/fonts), the typeface design arm of Jack Yan & Associates, announces that the majority of its font range now includes the Indian rupee symbol. It is among the first typefoundries to issue fonts with the new symbol. The fonts are now available for licensing from MyFonts.com and Typos in Switzerland, with retail licensing beginning at other distributors, including Phil’s Fonts, Fonts.com, Fontspring and Fontdeck later in the year. OpenType or Pro versions of JY Ætna, JY Alia, JY Décennie, JY Décennie Express, JY Décennie Titling, JY Integrity, JY Pinnacle, JY Tranquility and Yan Series 333 JY all now have the rupee symbol, done to the Unicode 6 standard. That means computer users who are running compatible software will be able to access the official rupee symbol that was approved by India’s cabinet last July through these font families. Jack Yan, founder and the designer behind most of the typeface families, has ties to India, primarily through academia. ‘I fell in love with India on my travels, and when the symbol was announced, I felt compelled that we should add it in for designers and all computer users in this wonderful country,’ he says. Mr Yan, who was born in Hong Kong, says that he tried to blend Asian and western influences into his rupee designs. The rupee symbol can be accessed on new keyboards in India by pressing Alt Gr + 4 together. 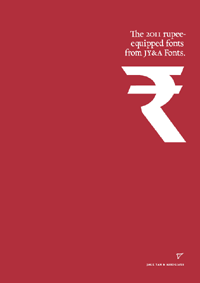 Images for this release may be downloaded at <http://jyanet.com/info/2011/08/typefoundry-adds-rupee-symbol-to-majority-of-font-range>. JY&A Fonts (http://jya.net/fonts) is part of Jack Yan & Associates, an independent global communications company founded in 1987. It is the oldest digital typefoundry in New Zealand and one of the longest-running in the southern hemisphere. JY&A Fonts, which has created typefaces both for retail sale and for private commissions, is known for its meticulous attention to detail, its careful and extensive use of kerning pairs, and elegant, restrained designs. JY&A Fonts represents designs from Jack Yan, Jure Stojan, David Philpott, Greg Bastin, Todd Hallock, Mark Geard, and Antonio González de Santiago.